For years and years, I've looked for the right recipe for Gooey Butter Cake. When I say "the right recipe", I mean the one I can use as the standard against which all others are compared. Well, usually, I'd only find a recipe that uses a cake mix as its base. Even Her Highness, Paula Deen, uses a yellow cake mix to make hers. Somehow this didn't sit right with me. Sorry, Miss Paula. I wanted to make it from scratch! Well, lo and behold, I finally found a recipe that makes its base from scratch. But wait! The cake mix recipe has cream cheese in it....and the scratch recipe uses corn syrup. Hmm....which one is authentic? Which one is the REAL Gooey Butter Cake? How does one decide? So then I decided to do some research to find out where the recipe originated. As it turns out, it comes to us from St Louis, MO, supposedly first made by accident in the 1930s by a St. Louis-area German American baker who was trying to make regular cake batter but inadvertently reversed the proportions of sugar and flour. Hmm...that still doesn't tell me which on is the REAL one. I also found out that The St. Louis Convention & Visitors Commission includes a recipe for the cake on its website, and it uses cake mix and cream cheese. But, according to my research, almost all bakeries in the greater Saint Louis area use a recipe based on corn syrup with no cake mix or cream cheese involved. Clearly, the only way to decide which was the "right recipe" was to have a Gooey Butter Cake-Off! And so it began. I made both recipes, the mix and the scratch. The mix was clearly easier to make, but the batter for the scratch was clearly much more buttery and in my opinion, much tastier. The scratch seemed to take a long while to bake, and they both turned out to be much darker than I had expected by the time the center had finally set. So I brought both cakes to a family gathering. Jeanie, Denny, Cathy and I all thought that the scratch recipe was much better, but that's not how the rest of the crowd saw it. Everyone else seemed to like the mix recipe. I think it was the cream cheese that pushed it over the edge. Ginger said she didn't even want to finish the piece of scratch cake, but she wanted to eat the entire mix cake. So there you have it. If you'd like to conduct your own Gooey Butter Cake-Off, please tell me your results!! Here are both recipes. Combine the first three ingredients. Mix well. Place into a 9x13 pan. Press the layer in evenly. Beat the last 3 ingredients together very well, until very light. Pour over the top of the dough layer in the baking pan. Bake 45 - 60 minutes at 350 degrees. Cool completely before serving. Preheat oven to 350 degrees. In a mixing bowl, combine 1 cup flour and 3 tablespoons sugar. Cut in 1/3 cup butter until mixture resembles fine crumbs and starts to cling. Pat in the bottom of a 9-inch square baking pan. For the filling, beat the 1 1/4 cup sugar and 3/4 cup butter until combined. Beat in the corn syrup and egg just until combined. Add the 1 cup flour and evaporated milk alternately, beating just until combined (batter will appear slightly curdled). Pour into crust-lined pan and bake for about 35 minutes, or until cake is nearly firm when you shake it. Let cool in pan on a wire rack. Remove to a serving plate; sprinkle with sifted powdered sugar, if you like. I used a golden butter cake mix instead of yellow cake mix, and I increased the scratch recipe by half and used a 9x13 pan. Big thanx to everyone in my family for being my tasters! Thank you so much for giving St. Louis credit for Gooey Butter Cake. I wish Paula Deen would do the same instead of insisting that she created it herself. Even her cake mix version has been around since cake mixes became available. In the search box type Gooey Butter Cake and you'll find the entry. Joey, I found you having been linked in a discussion at the STToday website food forum. Great site you have. We are discussing various recipes and someone offered you as a GBC example. I see you're using the Heimburger Bakery version. Like a lot of things there are a couple of different recipes considered to be the "one", so I'll leave you another that uses both corn syrup and cream cheese plus a little vanilla pudding. At any rate, you might want to try your scratch version again, but this time look to take it out of the oven shortly after 25 minutes, not 35. You should look for the edges to be browned but the rest of the cake still yellow or no more than golden--certainly not brown. Thats overcooked. And leave it to stand and finish abking itself for 2 or 3 hours in the the vessel it was baking in. You'll get a better result. Adjust an oven rack to lower-middle position and preheat the oven to 200 degrees. When the oven reaches 200 degrees, shut oven off. 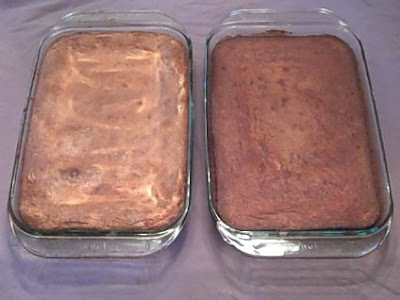 Line an 8-inch square baking pan with a sheet of foil that extends over two edges. Grease foil and a medium bowl. Prepare the dough: In bowl of a standing mixer fitted with the paddle attachment, mix milk and yeast on low speed until yeast dissolves. Add sugar, eggs, vanilla, salt and flour; mix until combined, about 30 seconds. Increase speed to medium-low and add butter, one piece at a time, until incorporated, then continue mixing for 5 minutes. Transfer batter to greased bowl, cover with plastic and place in warm oven. Let rise until doubled in size, about 30 minutes. Spread batter in prepared pan. Preheat oven to 350 degrees. Prepare the topping: Using paddle attachment, beat granulated sugar, butter and cream cheese on medium speed until light and fluffy, about 2 minutes. Reduce speed to low; add corn syrup, egg and vanilla until combined. Add flour and pudding mix; beat until just incorporated. Portion dollops of topping evenly over batter, then spread into an even layer. Thanks for the post, it is exactly what I was looking for (comparing the cream cheese vs. corn syrup variations). Although the "authentic" from-scratch recipes I have found call for yeast in the cake batter, and use corn syrup in the topping but no evaporated milk... I haven't come across any recipes with pudding mix like the previous review's recipe.